I found Vintage Printables via one of my daily reads, iDIY. As stated there, they have a huge collection of free downloadable, out-of-copyright images of vintage prints. And most of these puppies are really high-resolution, which makes them perfect for printing your own artwork. 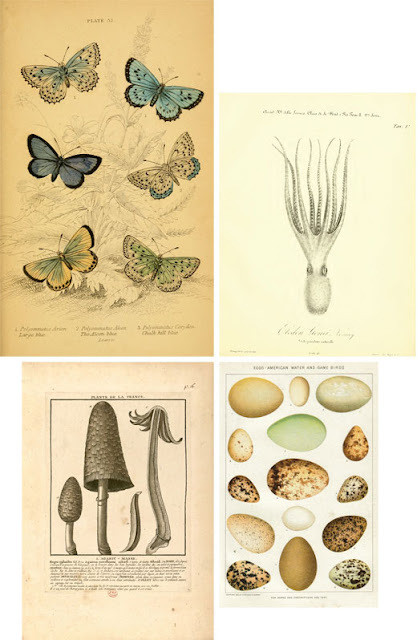 Mostly scientific and natural history-related such as botanicals, birds, animals, butterflies, shells, art prints, etc. I'm tremendously attracted to the mushrooms. (So elegant!) I think I'll use a few in my design for the office.